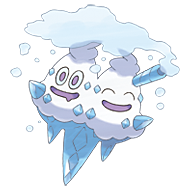 X If both heads get angry simultaneously, this Pokémon expels a blizzard, burying everything in snow. X Bringt man beide Köpfe in Rage, stößt sein Horn heftige Eisböen aus, und alles in seiner Umgebung versinkt in Schnee. X Quand ses deux têtes se fâchent en même temps, il émet un blizzard de ses cornes et enfouit les alentours sous la neige. X Si sus dos cabezas se irritan al mismo tiempo, genera una ventisca desde su cuerno cubriendo su entorno con nieve. X Se le due teste si arrabbiano allo stesso tempo, scatena una bufera dalle corna, coprendo di neve i dintorni. X 두 개의 머리가 동시에 화를 내면 뿔에서 강한 눈보라가 뿜어져 나온다. 주변을 많은 눈으로 묻어 버린다. Y Swallowing large amounts of water, they make snow clouds inside their bodies and, when angry, cause violent blizzards. Y Es verschluckt Unmengen an Wasser und wandelt es intern in Schneewolken um. Ist es wütend, erzeugt es Schneestürme. Y Il avale de grandes quantités d’eau et la transforme en nuages de neige. Il souffle du blizzard quand il se fâche. Y Absorben grandes cantidades de agua y la transforman en ventisca en su cuerpo, expulsándola cuando se enojan. Y Ingoia enormi quantità d’acqua che trasforma in nuvole di neve. Quando si arrabbia scatena una terribile bufera. Y 대량의 물을 들이마셔 몸 안에서 눈구름으로 바꾼다. 화나면 강한 눈보라를 일으킨다. Omega Ruby Swallowing large amounts of water, they make snow clouds inside their bodies and, when angry, cause violent blizzards. Omega Ruby Es verschluckt Unmengen an Wasser und wandelt es intern in Schneewolken um. Ist es wütend, erzeugt es Schneestürme. Omega Ruby Il avale de grandes quantités d’eau et la transforme en nuages de neige. Il souffle du blizzard quand il se fâche. Omega Ruby Absorben grandes cantidades de agua y la transforman en ventisca en su cuerpo, expulsándola cuando se enojan. Omega Ruby Ingoia enormi quantità d’acqua che trasforma in nuvole di neve. Quando si arrabbia scatena una terribile bufera. Omega Ruby 대량의 물을 들이마셔 몸 안에서 눈구름으로 바꾼다. 화나면 강한 눈보라를 일으킨다. 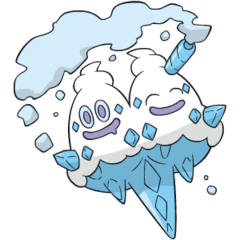 Alpha Sapphire If both heads get angry simultaneously, this Pokémon expels a blizzard, burying everything in snow. Alpha Sapphire Bringt man beide Köpfe in Rage, stößt sein Horn heftige Eisböen aus, und alles in seiner Umgebung versinkt in Schnee. Alpha Sapphire Quand ses deux têtes se fâchent en même temps, il émet un blizzard de ses cornes et enfouit les alentours sous la neige. Alpha Sapphire Si sus dos cabezas se irritan al mismo tiempo, genera una ventisca desde su cuerno cubriendo su entorno con nieve. Alpha Sapphire Se le due teste si arrabbiano allo stesso tempo, scatena una bufera dalle corna, coprendo di neve i dintorni. Alpha Sapphire 두 개의 머리가 동시에 화를 내면 뿔에서 강한 눈보라가 뿜어져 나온다. 주변을 많은 눈으로 묻어 버린다. Sun Each of its two heads has a brain, and when they are in agreement, it attacks its enemies by exhaling a violent blizzard. Moon Even if it loses one of its heads, it can live relatively problem-free. It makes snow clouds inside its body. White If both heads get angry simultaneously, this Pokémon expels a blizzard, burying everything in snow. White 2 Swallowing large amounts of water, they make snow clouds inside their bodies and, when angry, cause violent blizzards.